This casual three-piece sectional combines plush comfort with livable style, allowing you to appoint your living room with furnishings that are simultaneously fashionable and functional. Broad rolled arms, deep cushions and ultra-plush upholstery fabrics combine for casual style that the whole family will enjoy. A left-facing chaise, armless love seat and right-facing sectional sofa offer ample seating space for quiet nights in or gatherings with family and friends. 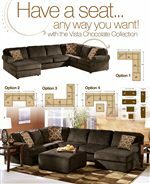 The Vista - Chocolate Casual 3-Piece Sectional with Left Chaise by Ashley Furniture at AHFA in the area. Product availability may vary. Contact us for the most current availability on this product. 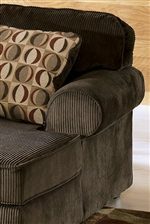 6840467 RAF Sofa 1 92" 38" 36"
6840416 LAF Corner Chaise 1 41" 62" 36"